Interest in the physical security market in the Gulf and wider Middle East is growing unabated and local companies, organisations and individuals have been importing a range of sophisticated items mainly from the West. The Middle East region’s physical security market is estimated to grow 25 per cent annually over the next five years to reach $11 billion in 2020, said a report. Physical security comprises a range of security hardware including access control, video surveillance, intrusion detection, perimeter protection, door alarms, as well as management software and system integration, designing and consulting. The surge in the sector, which was valued at $3 billion in 2014, is mainly due to the increasing appetite for advanced integrated security solutions, according to analysts Frost & Sullivan. The ongoing shift in demand from analogue to Internet protocol (IP) cameras in the Middle East is fuelling the region’s fast-growing physical security market, as global manufacturers prepare to launch their latest integrated security technologies at Intersec 2016. Demand has been growing at double the global rate, said the organisers of the Intersec expo to be held next year. Intersec is the world’s leading trade fair for security, safety, and fire protection, focusing on the six core sections of commercial security; information security; fire and rescue; safety and health; homeland security & policing; and for the first time in 2016, smart home and building automation. The integration of new technologies in video surveillance, such as cloud-based storage solutions and video analytics, will be under the spotlight when the 18th edition of Intersec opens from January 17 to 19 at the Dubai International Convention and Exhibition Centre. More than 400 of the 1,300 exhibitors at the three-day event specialise in CCTV-related products, including Swedish-based giant Axis Communications, and Hikvision, the world’s largest supplier of video surveillance products and solutions, they stated. Marwan Khoury, the marketing manager at Axis Communications, said the Middle East and Africa’s total network video surveillance market was worth about $420 million in 2014, with the convergence from analogue to digital or IP video in the region a major growth factor. “The convergence rates from analogue to digital is quite staggering in this region,” said Khoury. “In 2014, it was about 70 per cent network versus 30 per cent analogue. By 2019, the entire region will be 94 per cent network video surveillance, with countries like the UAE at nearly 100 per cent,” he noted. Ahmed Pauwels, the CEO of Messe Frankfurt Middle East, the organiser of Intersec, said the Middle East’s physical security market has assumed greater importance with the overall prevailing security scenario in the region. “Given favourable market conditions in most parts of the region, including ongoing growth in the construction industry, growing economies, increased urbanisation trends and middle class populations, the scene is set for a period of sustained growth in demand for ground-breaking security technologies,” he stated. “As more features are being brought into the ambit of electronic security systems, the focus of the user is moving away from a post-event analysis to prevention and thus analytics will play a major role,” he added. This sentiment is echoed by another Intersec exhibitor, Promise Technology – a leading developer of open storage solutions for the video surveillance industry. The US-founded company is introducing an interactive ‘Promise Theatre’ at Intersec 2016, where Video Management Software (VMS) vendors will demonstrate VMS solutions alongside Promise Technology’s storage solutions. “Most integrators and installers know every specification for cameras and VMS, but the knowledge around storage is still limited,” said John van den Elzen, the managing director at Promise Technology in Europe, the Middle East, and Africa. “At Intersec 2016, Promise Technology is bringing cameras, VMS and storage together with its own sessions and informative presentations from partners in the Promise Theatre. Elsewhere, Hikvision is debuting a range of CCTV cameras, access control systems and alarms at Intersec 2016. 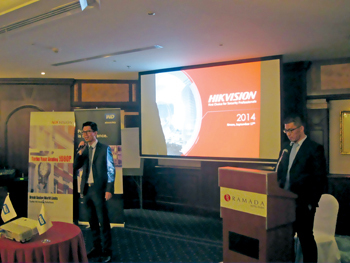 Binson Xu, general manager of Hikvision Middle East and North Africa, said his company is targeting the Small and Medium Business (SMB) security distribution market, as well as enterprise level projects in industries such as retail and oil & gas. “Our CCTV volume business is based on the distribution market, which takes around 70 per cent of our revenue, while the enterprise level project market is where we see the most growth,” said Xu. The annual showpiece event is returning with several new features, including Safety Design in Buildings Pavilion at the Fire & Rescue Section, and a Jobs and Careers Pavilion, bringing thousands of safety and security professionals in touch with the right career opportunities.